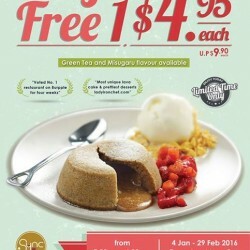 Enjoy and don't miss this exclusive Buy 1 Free 1 deal at SYNC. Double your happiness when you dine with them. The No.1 & the best favourite lava cake of all foodies. You won't be able to resist a warm, oozing lava cake served with ice cream. 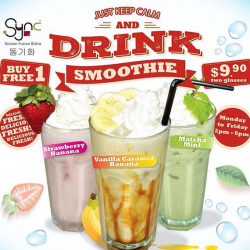 Beat the haze and the power to nourish us just as much with their buy one free one! Just keep calm and drink smoothie. Delicious, nourishing, satisfying and awesomely good for you.